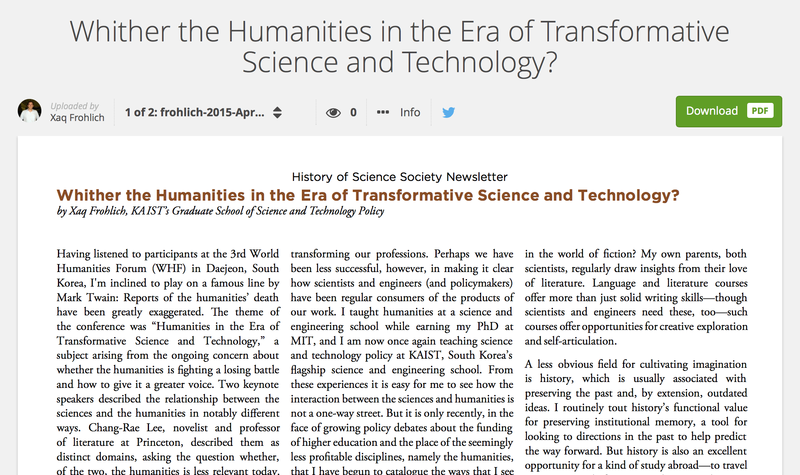 Whither the Humanities in the Era of Transformative Science and Technology? I got my PhD in history and social sciences at MIT, a science and engineering school. And now I’m teaching lessons drawn from history and social sciences at KAIST, a science and engineering school. Because of this, I’ve long been interested in the lessons or toolkits the sciences can use from the humanities, and vice versa. This past fall I attended the 3rd World Humanities Forum here in Daejeon, the theme for which was “Humanities in the Era of Transformative Science and Technology“, and the main debate was over what role, if any, could the humanities play in our modern technological present and future. Speeches by two keynote speakers in particular, historian of science Peter Galison and novelist Chang-Rae Lee, got me thinking about the relationship between the “Two Cultures“, and I found myself writing an essay listing what I saw as the key “products” that the humanities excel at creating which scientists and engineers (and policymakers) need. (I was also inspired by my dissertation advisor‘s op-ed last year in The Boston Globe, “At MIT, the humanities are just as important as STEM”, laying out arguments for way STEM needs the humanities.) 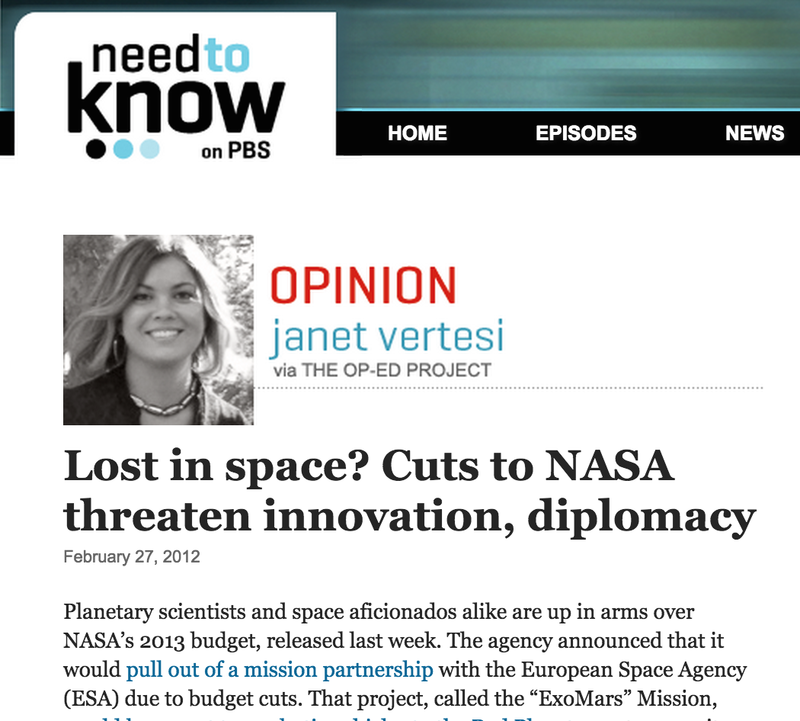 The result was an op-ed piece published this month in the History of Science Society Newsletter here (on pages 11-14). In the hopes of getting a wider readership, I’ve posted a copy of the article on my Academia.edu account here. I encourage you to read it in its entirety. But to summarize, I argue that different fields of humanities (history, anthropology, philosophy, literature and art) offer a variety of methods for cultivating creativity, moral imagination, humility and an ability to identify with “the other” (those who are not like us), and that these are necessary for scientists and engineers in their work because of how it shapes society more broadly. I then turn to the trickier question of how to bring the humanities to the sciences, tackling two separate challenges: how to build university curriculum and policies that incorporate both humanities and sciences perspectives, and how can humanities scholars build bridges through new media and technological platforms to reach a technology saturated techno-savvy public? You can read the article for my arguments about the first, but here I wanted take advantage of the blog to highlights some of the interesting projects I’ve seen my colleagues in STS conduct in the spirit of taking their intellectual tools to the people and engaging the public or public policy with ideas from the humanities that have relevance to the social and political challenges of today. One such example is my friend Alex Wellerstein‘s excellent blog, “Restricted Data: The Nuclear Secrecy Blog“, which uses the history of the nuclear bomb and cultures of secrecy to explore governing assumptions today about the bomb’s legacy or myth-conceptions about what lessons we can draw from its history. Alex made a fun and provocative online app NUKEAPP, which allows users to visualize an atomic bomb detonation on a map of their hometown. It got picked up the media and went viral. Suddenly his blog went from hundreds of page hits to millions, and he was pulled into all kinds of interesting media interviews about what did the public’s fascination with the app suggest about our relationship to the bomb. 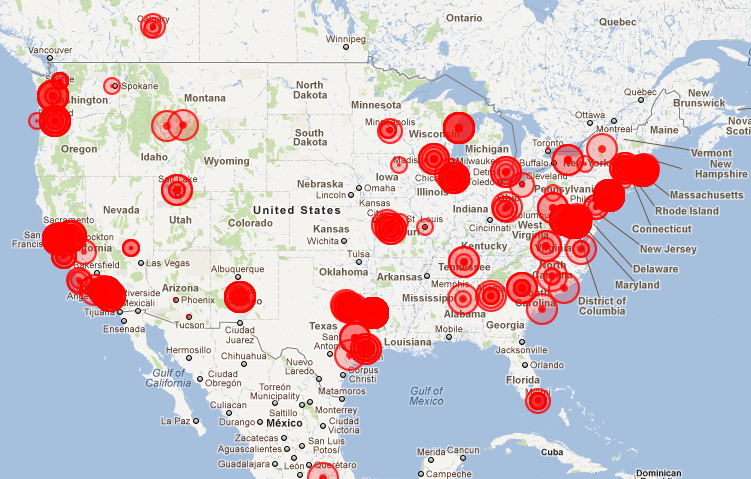 A map Alex posted early on of NUKEAPP use on his blog, where he speculated on what it meant for his users. Two other interesting online projects by my colleagues, which I’ve been following with interest being over here in Asia and teaching in a policy program, are Teach Sewol and Teach 3.11, both an exercise in how to transform a disaster and tragedy into a teachable moment. Teach 3.11 is an online web resource developed by Lisa Onaga and others following the 2011 Fukushima earthquake and nuclear meltdown. Lisa wanted to teach a class on disasters for her students who were trying to make sense of it, and she and others started to compile resources for the website to help others interested in teaching about it, too. Teach Sewol reflects a similar motivation to provide tools for educators wishing to make sense of a complicated, not to mention emotional social, economic, legal, and technological event. Chihyung Jeon and others, working with a design firm, have developed online readymade classes and discussion questions (in Korean) that Korean university and high school teachers can use to teach about the 2014 Sewol Ferry disaster. The idea of both projects is to elevate the public discussion to better consider policy contexts for risk and responsibility and to better make sense of the strong feelings that surround these and similar events. This week was the one-year anniversary of the Sewol Ferry sinking, and students at KAIST organized a very moving “Read-In” where they read out loud documents and key texts relating to the tragedy and its aftermath. This photo I took last fall of a memorial in Seoul, which shows the signature yellow ribbons worn here in Korea to remember the event. In addition to these educational strategies, some humanities scholars are more directly engaging in public policy and policy debates. Here many examples come to mind, but I’ll limit myself to two. The first was an edited volume published by a group of anthropologists who asked the question: why are we letting overconfident, thin analysis and pat observations scare us away from policy discussions? 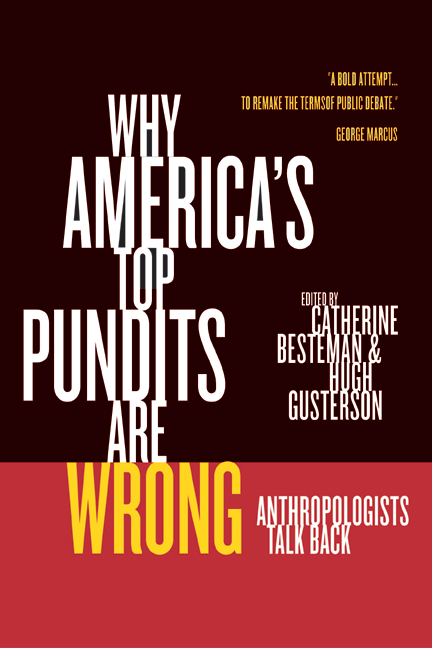 The result was the 2005 book “Why America’s Top Pundits Are Wrong: Anthropologists Talk Back“, where anthropologists engage common myths and misconceptions perpetuated by pundits in American news on complicated social issues they study, including globalization, ethnic violence, social justice, the biological roots of behavior, consumerism, the welfare state, and violence against women. Among them, Hugh Gusterson in particular has continued to write prolifically in public newspapers critiquing the assumptions about expertise or other cultures that mislead American policy abroad. Janet is no stranger to public engagement on policy matters. She also penned articles on space policy back when she was studying the Mars Rover project and remote sensing. For my other example on how STS scholars are engaging public policy in creative ways, sociologist Janet Vertesi took the trick of “participant observation” to a new horizon: she attempted to opt out of the private surveillance systems of big data that monitor our purchasing behavior in day-to-day transactions. The hook in her story was the she sought to hide her pregnancy from Facebook and other social platforms, only to discover that in order for her and her husband to do so, they had to go to social extremes (buying everything with cash or gift cards to disguise baby products) and inadvertently triggered national security protocols for criminals and terrorists. (Who else, after all, would want to hide from internet surveillance?) As one of her Facebook friends, at one point I and others were even hushed into silence about posting congratulations to her on the news, in case it affected the results of her study. Read about it here, it’s fascinating. The larger lessons she drew from her personal experience were that there was Big Data monitoring of almost everything we do, and that this has been happening with little public discussion about what opt in or opt out rights we as citizens, users, or consumers should have. And this is just a handful of examples of what directions the humanities are taking in the era of transformative science and technology. To summarize Peter Galison’s talk, new technologies and sciences are transforming our world in ways that raise core human questions that cut across disciplines. The humanities have as much, or arguably more of a roleto play today in giving people the tools they need to question, to doubt, to wonder, to marvel, and perhaps most importantly, to comprehend these transformations. This entry was posted in Uncategorized and tagged Digital Humanities, Humanities, STS, The Two Cultures by Comedo Ergo Sum. Bookmark the permalink. Hi, I’m Soo in south Korea. I wanna asking you I can take ‘the 2014 Sewol Ferry disaster’ photograph to my working. I’m making video work for my mother’s exhibition. The exhibition is opening July 2016, in Korea. It’s nonprofit. The exhibition’s target audience is kids, parents, and picture book reader. I want using this photo for my work’s background. If you permit my asking, I write your name on ending credit. I’ll wait for your answer. Thanks. 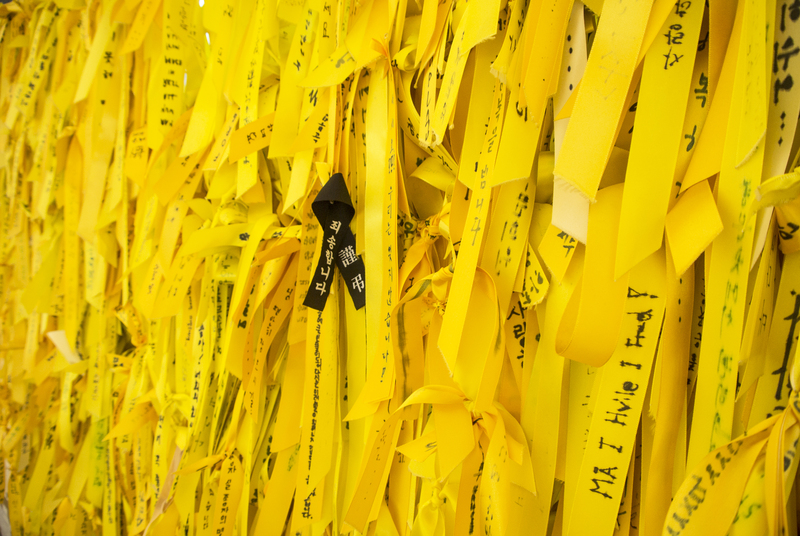 Of course, yes you can use my photo above of the black ribbon on yellow ribbons for the Sewol Ferry! And I wish you luck with your mother’s exhibition. Thank you for giving me credit.